The book of Philippians may be 2,000 years old, but throughout its pages Paul gives us clues about living that are just as valid for us today as they were for the believers in the ancient city of Philippi. 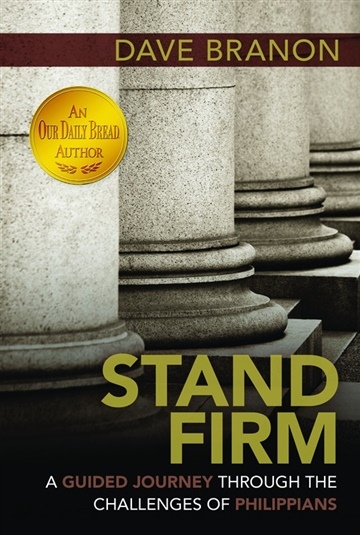 “We need to hear from a guy who was beaten, jailed, shipwrecked, threatened, and mistreated due to his allegiance to Jesus as he tells us how to stand firm and experience peace,” says author Dave Branon. Featuring 48 life lessons written in a down-to-earth style, this creative commentary-and-devotional combination brings clarity to Scripture and challenges us to be grounded in Christ no matter what happens in life. Perfect for individual or small group study. Dave Branon was the managing editor of the award-winning Christian magazine Sports Spectrum for 18 years, and is now an editor for Discovery House Publishers and RBC Ministries. Dave has written over 2,000 devotional articles and 14 books, including Heads Up and Undefeated. Dave and his wife, Sue, live in Grand Rapids, Michigan.